After an upbeat performance versus Peterborough on Tuesday, Charlton disappointed with their efforts here in a game that became increasingly drab as it progressed, Charlton were unable to make a goal count. A disallowed Grant effort and a couple of efforts of the line were not enough to secure a victory against a Fleetwood side who, bar a decent late save from Phillips, threatened little. The game saw a return to public protests organised by CARD. 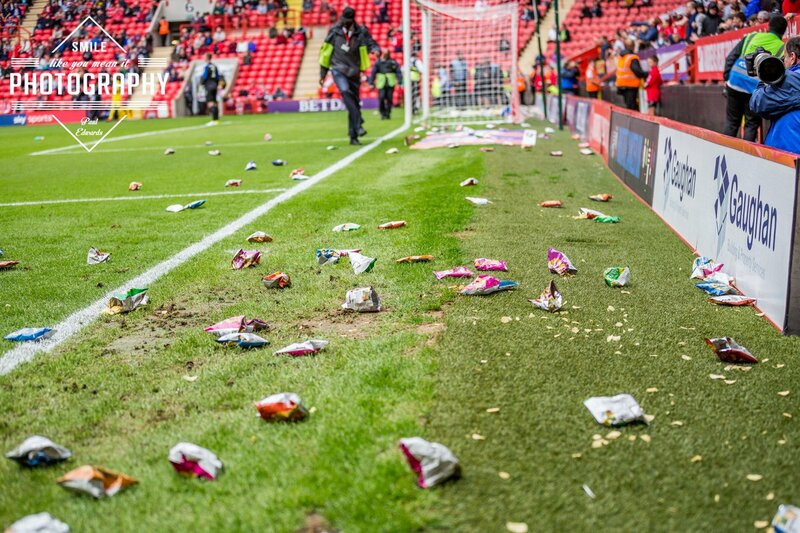 A pre-match rally was disappointingly attended (est 3-400), but the commencement of the game saw the game stopped while packets of crisps were removed from the pitch. Despite the muted impact at the game, it stunt generated huge column inches and media awareness. Bowyer: “I’ve said to the lads that, for me, it wasn’t really good enough. I expect more from them because I know what is there. Have we played badly? No, but there wasn’t enough drive and enthusiasm and hunger to win the game. “I’ve been told that we created 20 chances but only hit the target five times. “That shows our general play hasn’t been bad. From back to front, we look alright but that final third is what we have to keep working on. “Eventually we are going to get it right. We had two cleared off the line, Karlan has tried to slide one across for Lyle and Lyle has tried to slide one across for Karlan when he probably should have shot. “At the moment, when we should shoot we are passing and when we should pass we are shooting. We looked tired as well, we looked a bit lethargic at times and that is probably because we put so much into Tuesday." Phillips: “We need to thrive off of the clean sheet. We’ve conceded some late goals so far this season; some that we couldn’t help and some that we could have. @blackpool72 : Just got home from watching one of the most boring games of football I've seen in years. Not one of the worse as we never got hammered or anything like that. But that was as flat a performance and as quiet an atmosphere I've witnessed at the valley for a league game in years. Even the protest was flat compared to previous ones. The only positive s are that we kept a clean sheet and that Phillips and page appear to be getting better with each game. We desperately lack creativity in midfield and desperately need Fosu to return asap. Also it was good to see Vetokele back in a Charlton shirt again.